Electrology is the only scientifically proven method of permanent hair removal. Electrology is the specialty of permanent hair removal utilizing only solid needle type devices. Electrolysis has been shown to be permanent in over a century of use. Its permanency has been well recognized by knowledgeable physicians and is testified to by hundreds of scientific articles published in medical literature. Temporary methods such as shaving, tweezing, depilatories, waxing and stringing/threading require frequent time-consuming maintenance. In addition, skin irritation, ingrown hairs, discoloration, and scarring may result. Some of these methods also contribute to an increase in hair growth activity. All 3 modalities are safe and effective. Your electrologist will choose the modality that is best for you. Time is one factor for choosing electrolysis in today’s fast-paced world. Dealing with unwanted hair in a temporary way is tedious, costly and never-ending. Permanent hair removal frees you from this daily routine. Electrolysis also improves your physical appearance and self-image, lessens anxiety caused by the unwanted hair and helps you feel more attractive and socially acceptable. It’s a choice that will enhance your own natural beauty and self-confidence. Lastly, electrolysis has been proven safe and effective over many years of use and is recognized by physicians and American Medical Association. You can be confident that permanent hair removal will change your life in a positive way. Yes. Electrolysis has a 125-year history of safety and effectiveness. There has never been a reported case of disease transmission from electrolysis. We use only sterile disposable needles and a new needle is provided for each treatment. The tweezers are also sterilized before each treatment. Yes. Your electrologist should do a consultation with you and ask the relevant medical questions to determine if you are a suitable candidate. A few situations required a doctor’s note of permission before commencing your treatment. Hairy moles may be treated with written permission from a physician. Whether there is any discomfort during electrolysis is quite variable depending on the patient’s tolerance, epilator settings, the modality used as well as other factors. During most treatments, a definite sensation should be noticed. It has been variously described as a “slight heat”, “tingling”, or “stinging” sensation. There is no such thing as painless electrolysis. It is impossible to destroy hair growth tissue without sensation because its own network of nerve endings surrounds each hair follicle. The sensation, which may be felt, is assurance that destructive activity is taking place. Even though some parts of the body are more sensitive that others, adjustments can be made which may help to make the treatment more comfortable. Hair can be removed from almost any part of the body. Some common areas for women include the hair line, eyebrows, top of the nose, cheeks, sideburn area, upper and lower lip, chin, throat, neck, shoulders, back, chest, breast, abdomen, arms, underarms, legs, bikini line, hands, feet, toes, and fingers. Men often have hair removed from the hair line, beard line, shoulders, back, neck, chest, ears, and nose. Electrolysis is very helpful for treating ingrown hairs, which frequently cause irritation in the beard area. Deep, coarse hairs can not always be eliminated with one treatment; thus, breaking down the hair germ cells may require additional treatments. During the course of the treatment and due to the cyclic nature of hair growth, new hairs, as well as hairs emerging from a dormant phase will also be treated and may be visible the same time as finer re-growth hairs. All hairs have differing cycles of growth and are not visible on the surface of the skin at the same time. Hair normally grows for its usual cycle and then naturally sheds and replaces itself. 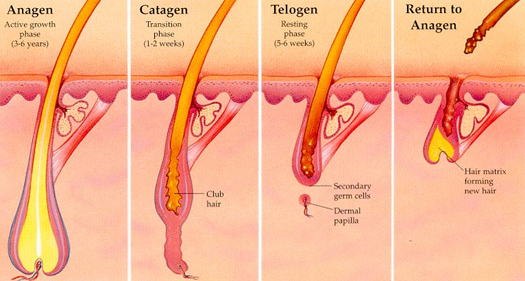 Following active growing periods, most hair follicles go into a dormant stage. The period of dormancy may last for an indefinite period of time, however, replacement hairs usually appear within 3 to 12 months. The appearance of these coarse replacement hairs from dormant hair follicles should not be mistaken as re-growth from previously treated follicles. Electrolysis has been performed for over 120 years and has proven to be an extremely safe procedure. Electrolysis, like many minor procedures in medicine, does have a short healing time. Because electrolysis destroys the dermal papilla of a hair (root), it is normal to see some slight redness, welting and/or mild swelling associated with the electrolysis treatment. In most individuals, this will disappear in half an hour to several hours. In some circumstances, electrolysis causes tiny scabs to form over the treated follicle. These dots are perfectly normal parts of the healing process and will not leave any permanent damage, providing you do not pick at them, scratch them, or otherwise cause them to be infected. An occasional bruise, localized swelling, tenderness, and in some darker skinned individuals, some hyper-pigmentation (excess pigmentation) may occur. Your electrologist will recommend the proper after care during the healing phase. Many clients report that their skin actually looks much improved after they’ve had electrolysis. Electrolysis is billed by the hour, typically broken down into 1 hour, 45 min., 30 min., and 15 min. sessions. The total treatment can vary greatly from one individual to another. Some improvement should be observed within the first few treatments, provided the client adheres to the recommended schedule. It is important to realize that time, commitment, and patience are needed in order to overcome a problem which did not develop overnight.